CHA Day 1 – UPDATED, this time with photos! 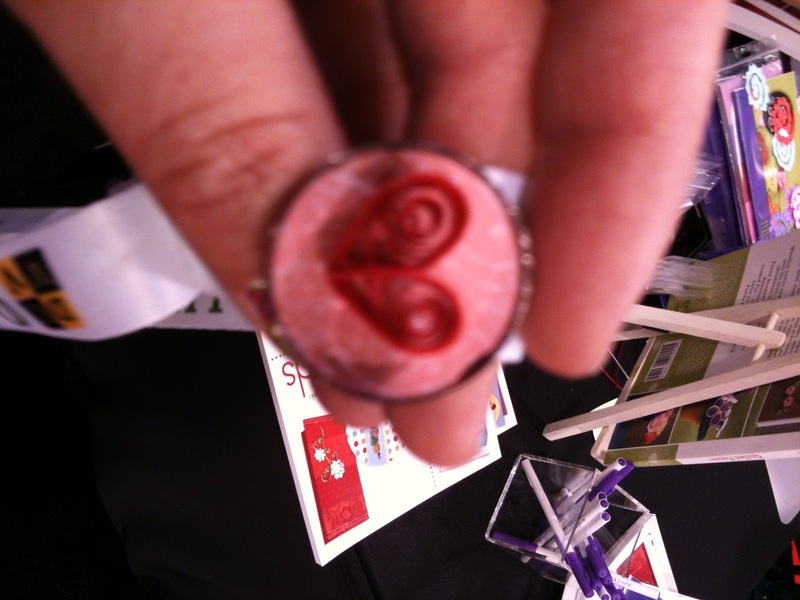 I tried quilling for the first time (something I’d been afraid to try before) at the Quilled Creations booth – and it was fun! (www.quilledcreations.com). Saw some great new stamps that will be coming out from Technique Tuesday and Lawn Fawn… (it’s probably good they don’t let you buy)…. I spoke with the the people at the Sillhouette Cameo booth and saw some of the great things the machine can do (did I mention it was delivered – I just can’t open it yet)??? (www.silhouetteamerica.com) I’m pretty excited about it! 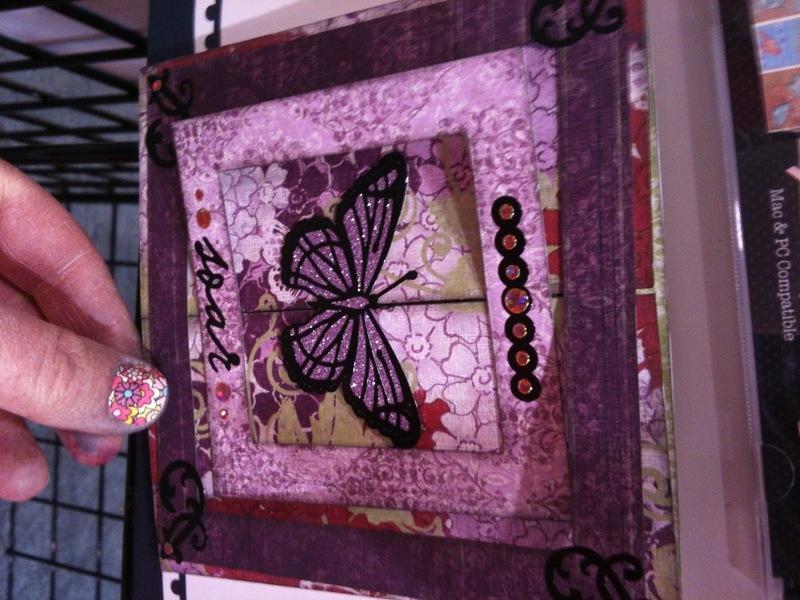 The people from hot off the press (www.b2b.hotp.com) showed me some amazing new products – isn’t this an amazing card??? 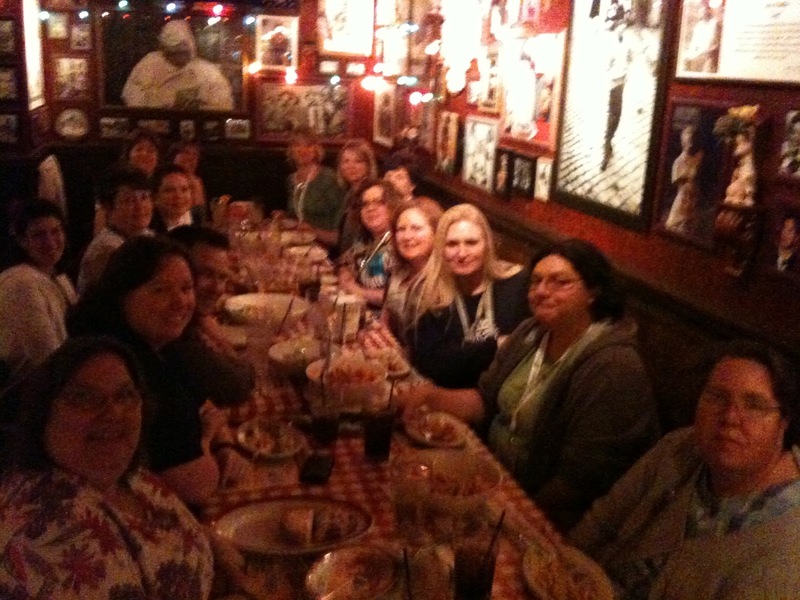 And to top it all off, I got to go to Bucca Di Beppo with 14 other crafty ladies that I knew on facebook but not in real life. It was a blast!!! I will say – if you ever get the opportunity – you should go… It’s amazing! For today’s card I decided to make a masculine card. Now I have to admit these are some of the toughest cards to make as you can’t add bling which I love and ribbon can make it look girlie. So I had some really cute paper that I got on clearance at Michaels. I wasn’t sure where to use it so I decided to try it out on this card. I used my Cricut E2 for this A2 size card and the Just a Note Cricut Cartridge. I love this cute cartridge. 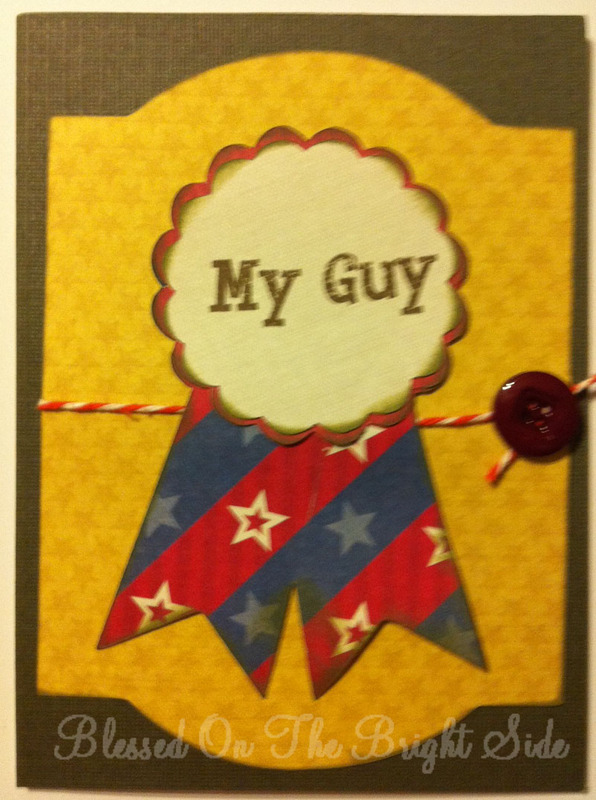 The stamp is from CardzTV Stamps “It’s A Guy Thing” and goes perfectly with this ribbon. I added a base mat from Cricut Lite Lacey Labels and then some twine and a button. My husband said it was simple and perfect for a guy. Although I’ll admit, I really wanted to add bling. LOL. This card is perfect to show that guy in your life that you care. I gave it to mine to show him I appreciate him and all that he does for our family. It has been so much fun joining you this week. I hope you will check out my blog at Blessed On The Bright Side. Hi everyone welcome back. Thanks for joining me for another fun card. Today’s card is from one of my favorite cartridges. I actually have made this card before but this time changed it up a bit but adding Googly eyes and the flower which was my daughter Carleigh’s idea. 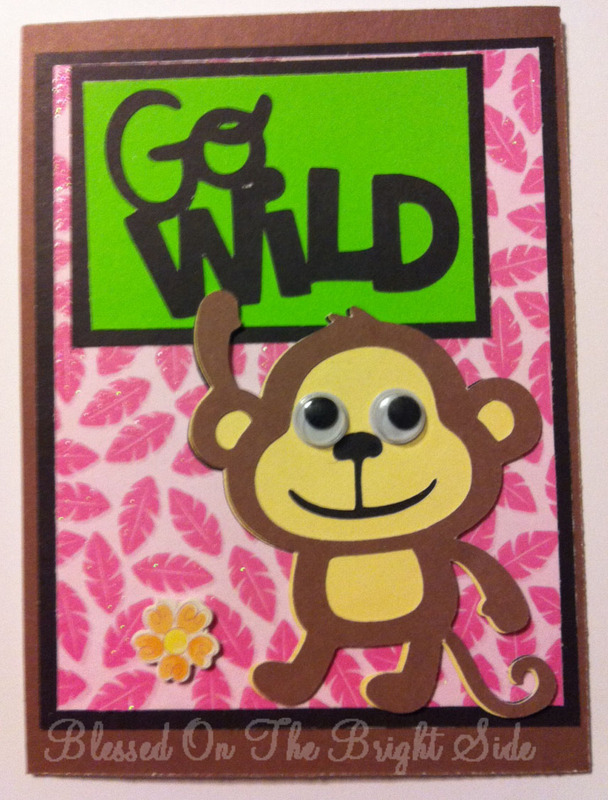 The monkey and Go Wild is from Create a Critter. Then this beautiful pink leaf cardstock is from an animal fun stack I got at Ross a while back. If you don’t check the Ross scrapbook aisle…do. You can get some of the best paper bargains in those aisles. You’d be amazed at the punches and papers that you’d find. 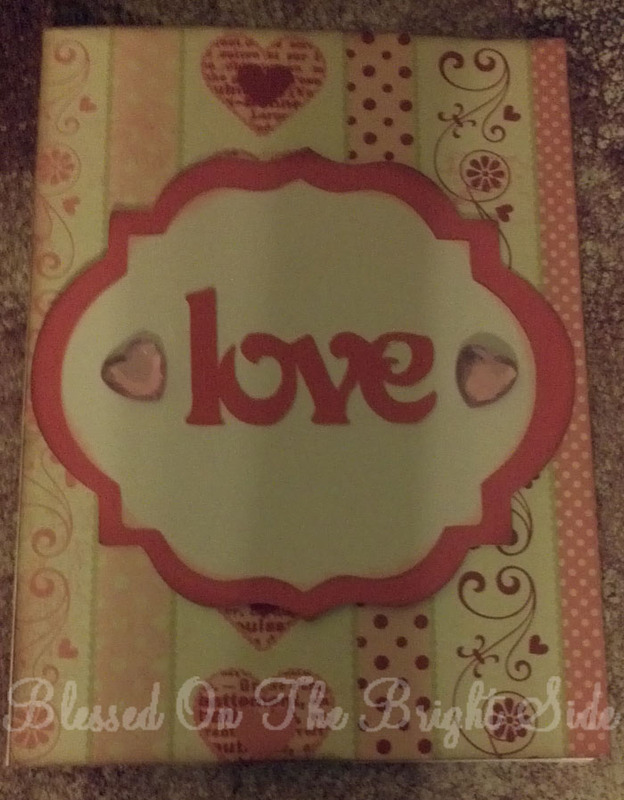 The file to make this card from Cricut Craftroom will be on my blog later today. I made this card for my friend Melanie. This cards bright colors and cheery monkey will make anyone smile. I will see you tomorrow with another fun card. Thanks for joining me! Hi everyone, I am Shawnee and I am the guest designer for this week. I am so honored to be joining you this week. I love to make cards to encourage people and make them smile. For today’s card I made a standard A2 size card using Cricut Lite Lacey Labels, my Cricut Imagine, and Je t’adore collection from Making Memories. I cut the Je tádore paper at 5 inches by 4 1/2 inches. Then the dark pink mat is cut at 4 inches followed by a white mat that is cut at 3.5 inches. The word Love is cut from the same cartridge at 2 inches. Finally I accented it with simple heart rhinestones for a little bit of bling. Simple but easy to make over and over if you had to. I inked around the edges with Chocolate Brown ink which made it stand out a little more. See you tomorrow for another wonderful card! Hi everyone I am guest designing this week for Jennifer. I wanted to share some of my recent cards with you. With Valentines day around the corner I made so love cards to donate to OWH. I kept the Happy Valentines off so they can be used as love cards anytime. All the images are Bugaboo and colored with Copics. The paper was bought in single sheets and scraps from my large collection of left overs. 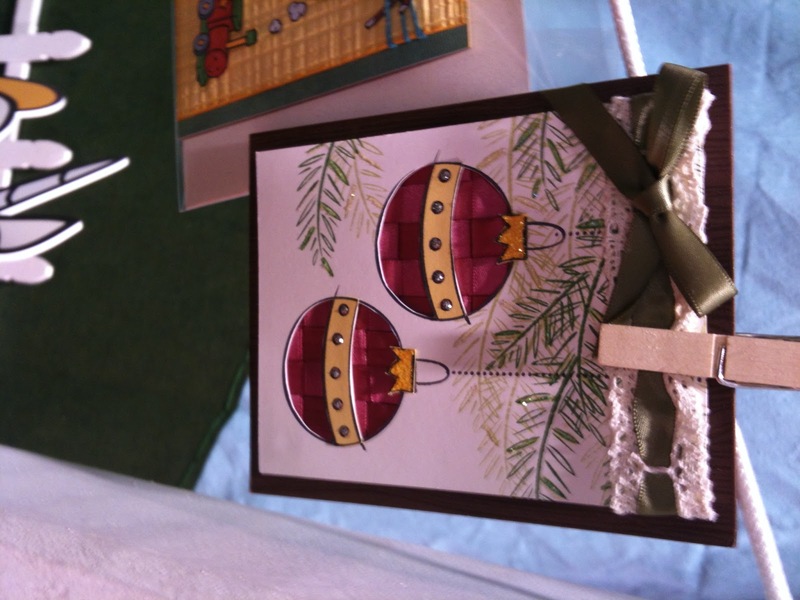 Hope you all enjoyed my cards and stop by my blog sometime. Hi! Welcome to the history in my lifetime blog hop! I signed up for the all about me scrapbook group, and this is part of that book. I chose the iPhone/iPad as the historical event that affected my life. I know that sounds dumb, but it has had a significant impact on my life. Here’s my two page spread, in my smashbook! If you’re new to my blog, be sure to become a follower. Please help me get to 800! Now what you’ve all been waiting for – my 750 follower giveaway….. I will be having fabulous guest designers in January & February… So what I’m going to do (to make sure they get some appreciation too)….. I will give away 3 prizes – 1) a cricut cartridge (I will post which one after I buy it), 2) a bite size body guide diet & fitness journal and some stickers & clear stamps and 3) some cuttlebug dies, stickers, embellishments & clear stamps. All 3 winners will get a free copy of the soon to be released new iPhone app…..
How will I get my winners???? It’s hard to think something as simple as a phone would have a big impact on my life, but it has.. So when my contract was up, i was contemplating either an iPhone or an android (which was new technology at the time). I chose the iphone, and was super excited about it! I even posted on facebook from the apple store with my new phone!! I showed it to my dad – he had technology envy (I finally learned where I got it from)… So I bought him an iphone too! I celebrated my one year blogaversary in October 2011… It has been so rewarding meeting all of the people I’ve met (mainly online) and interacting with so many people that are so creative! 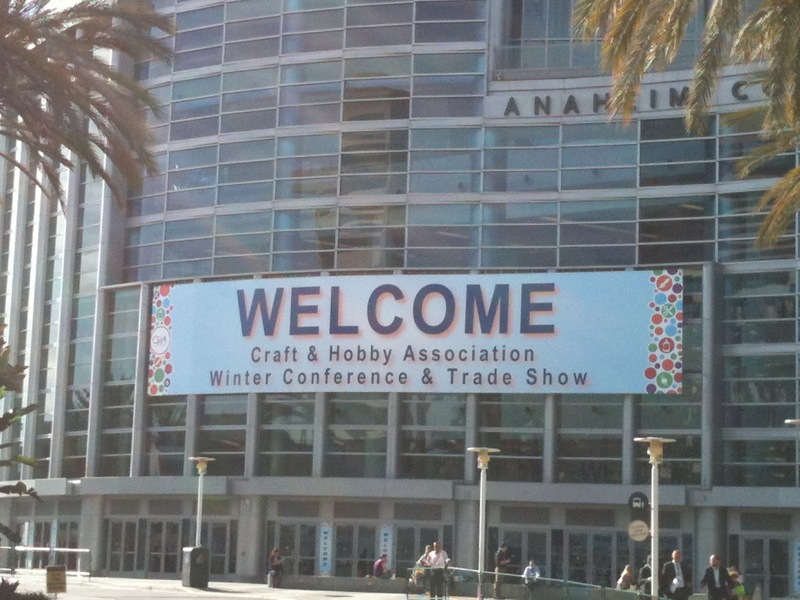 I actually got to meet some of the people that are local in real life at the scrapbook expo! I have fully embraced all things apple…. So I signed up for the all about me scrapbook group & signed up for the history in my lifetime – and I chose the iphone as my history… Shortly thereafter Steve Jobs passed away… I have to admit, although I never met him or followed his life much – it saddened me that he had died… he was such a creative man; it seems like such a big loss. What types of things do I use my iphone/ipad for?